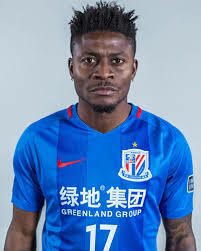 There may be hope for the once acclaimed Nigeria's weapon of mass destruction, Obafemi Akinwumi Martins who currently plays with the Chinese side Shanghai Shenhua to play at the 2018 FIFA world Cup in Russia. This came while Nigeria's coach Rohr was speaking with newsmen from Russia. He affirmed that if Martins keep scoring then he will be invited. He also pointed out to several attacking options before him which includes Odion Ighalo, Victor Osimhen, Kelechi Ihenacho and Anthony Nwakaeme. According to him, goal scoring form will be the basis for selection.